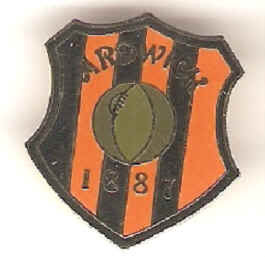 Manchester City were originally known as West Gorton St Marks when they were formed in 1880, however in 1887 they changed to Ardwick FC, below is an example of an Ardwick badge. We’re not sure whether this an original design or a recent remake but it’s a nice example anyway !! Following financial problems they were formed into a limited company in 1894 and at the same time changed their name to Manchester City. 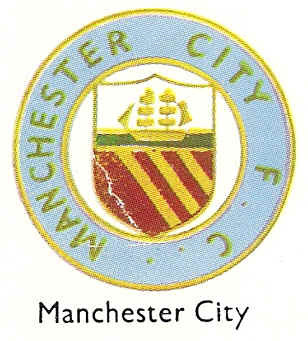 Their first badge (below) was the Citys Coat of Arms, several elements of this badge have survived so its worth explaining them now. The antelope and lion which support the shield are derived from the arms of King Henry IV, Duke of Lancaster. Of course the Red Rose of Lancashire has to be represented and so it is on both of these animals. Finally the motto “CONCILIO ET LABORE” translates to “BY COUNSEL AND WORK”. We’re not sure exactly at what point City changed from this design, some think it was late 50’s whilst others suggest it was in the mid 60’s. We have however found an example of the “new” badge in the 1958 Encyclopedia of Sport, below. 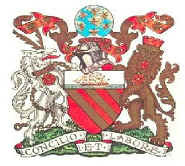 As you can see the more old fashioned aspects of the coat of arms had been done away with. The ship and golden stripes did remain though with the team name added around the edging in a light blue circle. 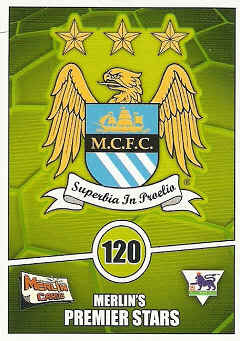 Light blue of course being Citys predominant colour. The badge remained the same until the mid 70’s when the Red Rose of Lancashire replaced the gold stripes, unfortunately we haven’t been able to find an example of this. If anyone has a picture of one they can send us we would be very grateful. Of course it is thought the real reason behind the switch was to ensure the club could fully copyright the new design. In fairness though to the club they did keep the main element of the original design in as much that the ship and gold bands were the centrepiece of the new badge. The clubs initials were also added to this shield. The shield was flanked by what appears to be a Golden Eagle along with the addition of 3 gold stars which we’re assuming were added to give it a continental feel. Please note that in order to ensure we don’t fall foul of copyright laws by inadvertently showing an unofficial picture of the new design we have scanned in one of our own collection of Merlin trading cards that does show the new badge in all its glory.